White iris on a full eye black sclera. A fantastic addition to any Halloween costume. 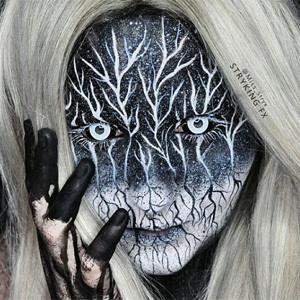 With these contact lenses dressing up as a zombie is no big deal – a bit of dirty, torn up clothing, messy hair and ColourVue Sclera Medusa contact lenses and you’re done. They give you an amazing look thanks to the fact that they cover your whole eye making it black and white (but black colour is on the outside). ColourVue Sclera 22mm contact lenses provide you with a very professional, Hollywood standard in costume contact lenses. Try them now and feel like a pro!